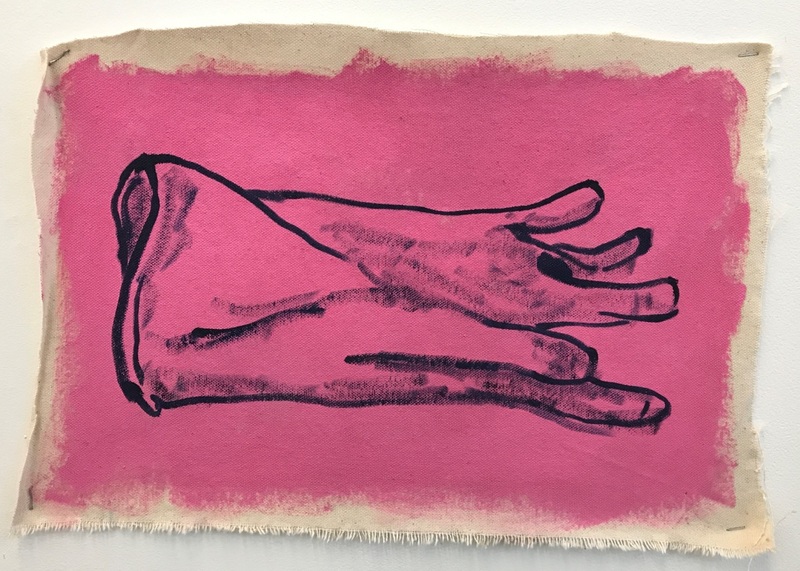 24 BA Painting students across first, second and third year will exhibit small-scale drawing works in an exhibition entitled ‘Traces’, showing at the Central Saint Martins Student Union Project Space. 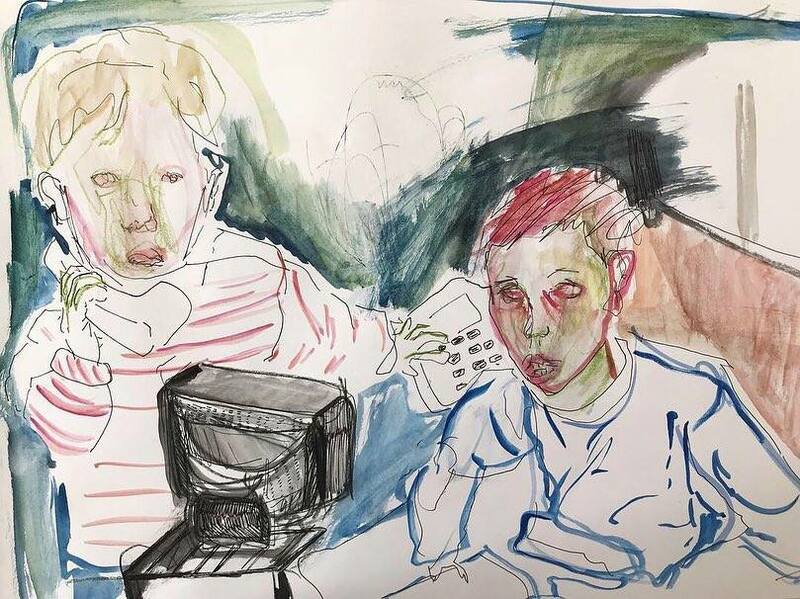 The exhibition, organised primarily by second-year BA Painting student, Henry Glover, aims to establish the significance of drawing within an artist’s overall practice, and will demonstrate how each exhibiting artist interprets drawing as a medium. We spoke to Henry and fellow second-year BA Painting student and exhibiting artist, Emma Morgan, about the importance of drawing in their own practices, and how their painting practices have evolved and changed throughout the course so far. Can you talk about how the exhibition ‘Traces’ came about? Henry: The UAL Student Union has project spaces you can apply for to exhibit work in. I was meaning to apply for one last year but ended up missing the deadline, so I made sure I applied in first term of this year. I didn’t think I would get it, but I was pleasantly surprised that I did. I had to send a proposal as part of the application, so I was thinking about what sort of show I could set up in a short amount of time. I thought that doing a pop-up drawing show would be a good idea because many artists would already have work available that could be featured. I didn’t know how many other students I would have gotten involved in the exhibition when I wrote the proposal. I knew I wanted it to be a drawing show, from the BA Painting course, focusing on the interpretation of drawing from a painter’s perspective. There are 24 students in total showing in the exhibition, across first, second and third years. The exhibition focuses on how drawing is the most immediate form of expression within an artist’s practice. How important is drawing to your own individual painting practices? Henry: For me, drawing is always part of any process that I engage with. Even if I’m making something with my hands which is very sculptural, at some point beforehand I probably will have mapped it out with a drawing to help me along the way. Drawing is always there as a part of my process, whether it’s at the beginning or the end. It’s a constant reminder of what I’m doing. I tend not to treat drawing and painting as being that different in terms of ways of working. The way I paint feels a lot like drawing. Emma: I think it’s the same for me. When you paint you draw, and when you draw you paint. When I paint something, I’ll either draw what I’m going to paint before I paint it, or draw straight onto the canvas or board. I use drawing to describe what I’m going to paint and the subjects I’m going to include, but it doesn’t feel like the same kind of language that I use in a finished painting. In that sense, I wonder whether or not drawing can be seen as ‘final’, because it’s something that I am constantly doing, but it never has the same sense of completeness that my paintings have. What do you see as the relationship between painting and drawing? Henry: Being painters, I feel like we view drawing as equal to how we view painting, because you can’t have one without having the other. I think paintings have qualities that are more transformative than drawings, but I don’t think you can paint without having made a drawing within the painting, however you wish to define that. Hopefully our exhibition will discover this relationship between painting and drawing. It’s up to the individual to create the definition of what drawing is. Whether or not you want to treat them differently or unequally in your process, that’s up to the artist. Maybe some people see painting as a complete work and a drawing as incomplete, but I don’t think that’s true for me. Naturally people assume drawing is something you do first before you paint, so maybe that’s why to some artists it doesn’t have the finality of painting. Emma: I’m showing a tonal negative space drawing which I have created from a photograph. The point of doing it was to figure out how I would paint it, because I wanted to transfer the effects of the negative space. I think in that way, I’m using drawing as a tool to inform my painting work. Henry: Some works that will be shown are definitely completed works, others are building towards a more developed idea further down the line. The exhibition is mostly 2D works, but there are a few sculptures. 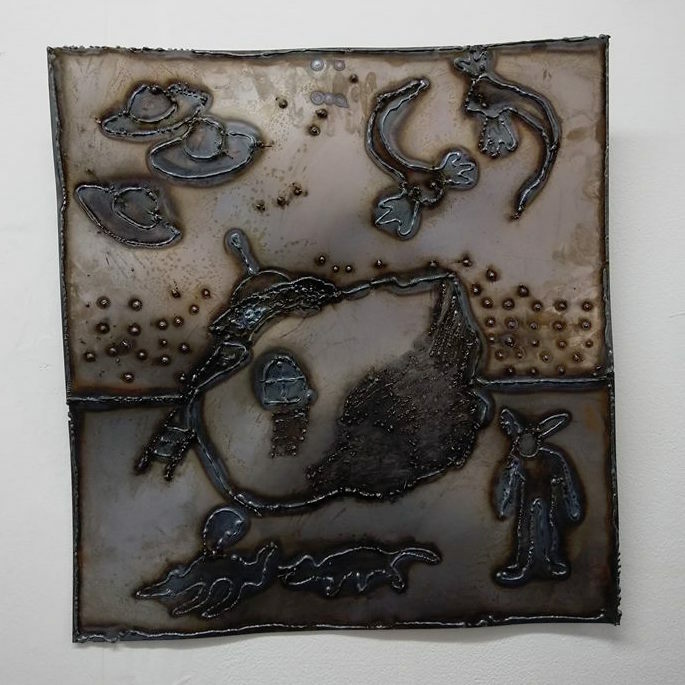 Erin Adderley, a third year student, is showing 2D works and is also showing 3D cut-outs, which look like her cartoons have come to life as sculptures. Tashi Djago from second year is showing a copper wire sculpture that features these bulbous shapes and contours; it’s a sculpture with the feeling of a drawing. The show is trying to encourage all different ways drawing manifests itself in our practices. The exhibition aims to demonstrate how each artist interprets drawing as a medium. How do each of you interpret drawing? Henry: We recently visited a drawing show at the Royal Drawing School. All of the works in the show were 2D, but there was still a wide range of different styles; paintings, pastel drawings and lots more. The only restriction the artists in that show had was that their work had to be displayed on either paper or card, so that was their definition and interpretation of drawing. I think it is different for everyone, but I would argue that if the notion of drawing is there, then the work could be considered a drawing. The act of mark making or process is what defines a drawing, I think. Emma: I think that both drawing and painting can use the same techniques but maybe in different ways. In that sense, the skills that are involved overlap each other all the time. They both involve the delineation of form and content. As part of my practice last year, I was focusing on the idea of painting being reactive. It’s reactive in the sense that when you paint something from life or from what you see, you are responding to what you see. Then, as you are working on the painting, you are responding to previous marks made. I think that’s the same for when you draw. For me drawing is most fun when it’s a natural and responsive process, but drawing can be all sorts of different things to different people, and that’s one of the things that the exhibition is going to demonstrate. What are some of the challenges involved with organising and curating an exhibition of this size? Henry: 24 artists is a large number, so it’s quite an undertaking. To curate it, it’s on me to mediate between each artist’s wants and needs. The only real structure I set about for the show, because of the limitations of the space, was to keep the works small; no large scale works. In terms of install, everything is very simple, just hanging or pinning. It’s exciting, because we’re engaging with so many different people who have different artistic styles and are from different backgrounds. It is going to be a real melting pot of works dotted all over the space, and the visitor will get a sense that they don’t know where to look. How are you enjoying the second year of the BA Painting course so far and what are you working on? Emma: It’s going well this year. I’ve started working with found images. I found quite a few folders of family photographs from my grandparents, so a lot of them were quite old. I’ve been experimenting with what I can do with them, which has involved a lot of drawing. I’ve been holding off on painting until I really know what I want to say, until I can analyse these images and get exactly what I want from them. 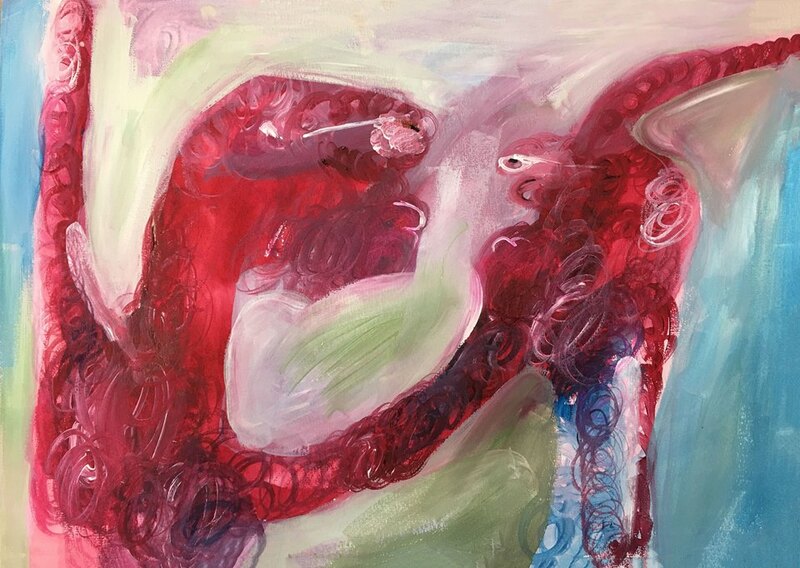 I have always been a figurative painter, but last year I was working from either life or pictures that I had taken, so it was very much inspired by things going on around me. Now that I am using old photos, the subjects are almost twice removed in that I don’t know who they are, but I have a feeling or sense towards them because they were in photos belonging to my family. In that sense, I have more freedom with how I portray them, and it will be different to painting someone when you have a personal connection to them. I’m really interested in exploring this idea further. Henry: I’m enjoying this year. We’ve got a lot on so it’s about trying to balance our time. My works at the moment are trying to involve the human form with more ambiguous bodily forms which are doll-like. This gives me more freedom to orchestrate what I want to happen in an image and how I want the figures to react or feel, so I can command the narrative and emotions within the painting. I’m involving the human figure again, as opposed to last year where I wasn’t using it as much, to help me understand what I’m doing. I’m still unsure of what I’m trying to portray and what emotions I’m trying to show. Maybe my own insecurities are being helped by these paintings, because in their own way they’re unsure of what they’re trying to say just like I am. Traces is showing at the Student Union Project Space at Central Saint Martins from 22 – 30 November 2018). Find out more here.